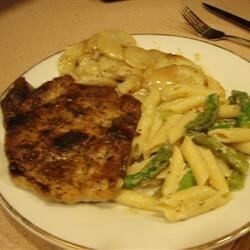 "Good, simple pork chops simmered with potatoes in a mushroom sauce." In a large skillet, brown pork chops with a little oil over medium-high heat. An electric skillet can also be used. Add potatoes and condensed soup. Do not dilute soup. Cover and cook for 45 minutes, or until potatoes and chops are fully cooked. This was so good! My husband and kids loved it. The meat was very tender and the potatoes tasty. I added garlic powder, salt, pepper and onions and had it with fresh green beans. Delicious!